← The Sports Archives – A Brief Overview of the FIFA World Cup! No doubt you’ve seen boxing and MMA on TV, and thought to yourself that these people aren’t the sort you’d like to rub up the wrong way. Indeed, participating in martial arts requires a high pain tolerance, excellent conditioning and a willingness to inflict damage on your opponent. But, although they don’t demand the same type of aggressive physical contact, there are a number of other sports in which a hard-nosed attitude can stand you in good stead. Football, rugby and hockey are just a handful of contact sports in which having a heavy-hitter on your defensive line can make all the difference to your team’s success. Unfortunately, some have been known to take things too far, causing pain and injury to themselves and others off the pitch on occasion – leaving at least one person in need of serious relief. The big man striker was known for his presence on the pitch. But he also made his presence known to an intruder who tried to steal from his home in 2001. The burglar required treatment in hospital after Ferguson apprehended him and took him down. This wasn’t the first occasion on which this had happened either – two years earlier, Ferguson tackled two men who tried to break into his home, and managed to hold one until police arrived. So, burglars beware, Big Duncan isn’t a man to be messed with. The Irishman’s reputation as a defensive enforcer was no secret during his late 1990s and early 2000s heyday. 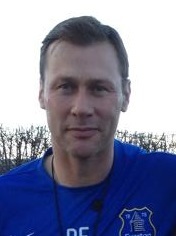 But someone who will probably never forget the United captain’s take-no-prisoners approach is Alf-Inge Haaland. Known as the ‘horror tackle’, Keane took out Halaand with a savage challenge in 2001 which effectively ended the Dutchman’s career. 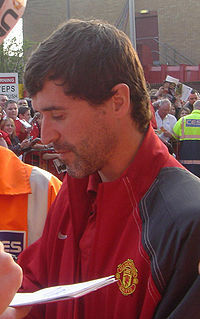 And all allegedly because Haaland had criticised Keane for feigning an injury during a game some four years previously. When it comes to hard men, there are few rugby players whose reps can stand up to Buck Shelford’s. The All Blacks enforcer during the 1980s, Shelford even attempted to finish a game once after receiving a kick on the pitch which ripped open his scrotum. After literally being stitched up, Shelford finally had to call time on the game that day when a further blow gave him a concussion. In the NHL, you don’t earn a nickname like Captain Crunch by endorsing a cereal. You do it by bursting onto the scene for the Toronto Maple Leafs, and racking up as many penalties as you can from the off. 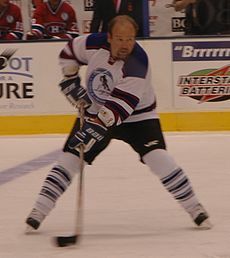 Wendel Clark was feared for his brutal and aggressive body-checking style during the peak of his playing career in the late 1980s and early 1990s, and has gone down in legend as one of the hardest hockey players of all time. He was also more than partial to the odd pugilistic endeavour on the rink as well. This article is written by Anna who has been prescribed Champix by her doctor to help her stop smoking. She recently joined gym to keep herself busy, when she isn’t working. Nine Terrible Football (Soccer) Tackles That Ended Careers! This entry was posted in Hockey, Other, Soccer and tagged aggresive sports, Alf-Inge Haaland, Captain Crunch, contact sports, Duncan Ferguson, Roy Keane, Rugby, Sports Archives, Sports Blogs, sports injuries, Toronto Maple Leafs, tough sports, Wayne Shelford, Wendel Clark. Bookmark the permalink.